We studied the nine manifestations of holy spirit in the last chapter, and showed that each Christian can manifest all of them. Nevertheless, 1 Corinthians 12:8–10 seems to say that each Christian is given only one of the manifestations, and this has confused and weakened the Church. It is important that we properly translate and understand these verses. 7 Now to each one is given the manifestation of the spirit for the common good. 8 For to one is given through the spirit a message of wisdom; and to another a message of knowledge because of the same spirit;2 9 to a different one faith by the same spirit; and to another gifts of healings by the one spirit; 10 and to another working of miracles; to another prophecy; to another discerning of spirits; to a different one various kinds of tongues; and to another the interpretation of tongues. 11 Now all these the one and the same Spirit energizes, distributing to each one individually just as he purposes. We have seen in Chapter 8 of this book that each Christian can manifest, or bring into evidence, the gift of holy spirit in the nine different ways that are listed in the verses above. Each Christian can hear from God (a message of wisdom or knowledge), speak in tongues, interpret tongues, prophesy, have faith, do miracles, healings, and discern the presence of spirits. In spite of that, there has been great confusion in the Church about how many of the manifestations an individual is able to operate. At first glance, 1 Corinthians 12:8–10 does appear to say that any one person will be given only one of the manifestations. This contradicts the evidence we gain from other Scriptures, so what do these verses mean? The explanation of why the Bible says, “to one…to another,” becomes clear as we study the context of 1 Corinthians 12:8–10. The Church in Corinth was deeply divided. This is apparent from the very first chapter of Corinthians, when Jesus, via Paul, appeals to them so that there would be “no divisions” among the people (1 Cor. 1:10). There was jealousy and quarreling among the believers (1 Cor. 3:3). They were even suing one another in the Roman courts (1 Cor. 6:1–7). They would not share their food with each other, and when they came together to eat, one got drunk while another stayed hungry (1 Cor. 11:21). They were even trying to use the divisions between them to determine who had the approval of God (1 Cor. 11:18 and 19). 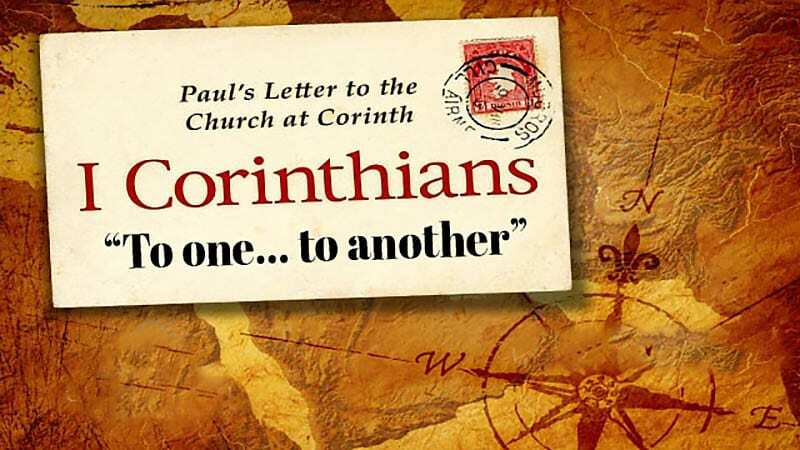 The division and quarreling in the Church at Corinth is the background of 1 Corinthians 12, and is a major factor in why the “spiritual things” of 1 Corinthians 12–14 are presented to show that God and Jesus work in harmony to produce different spiritual gifts, energizings, and manifestations that bless and build up the entire Body of Christ. The great lesson of 1 Corinthians 12 that was essential for the Corinthians (and us) to understand is that spiritual things may be different, but it is the same God, same Lord, and same gift of holy spirit that produces them. No man is spiritually gifted in and of himself. The gifts, the power, and the manifestations all come from God and the Lord. Based on that, we can all be thankful for who we are, what we have, and that we can work together. (6) and there are distributions of energies, yet the same God who energizes all things in all ways. Note the three repetitions of “distributions.” The focus here is not on what a person has, but rather that there has been a “distribution” to the person by the Lord Jesus. Had the Corinthians understood that, it would have gone a long way toward unifying them. Instead of being proud of their differences, they would have been proud that the Lord cared for the entire Body and equipped people differently so that everyone in the Church would have all their needs met. Verse 4 speaks of the charismata gifts that are distributed, and gifts are individually given. Each person receives his own gifts, which include salvation (Rom. 6:23), a gift ministry (i.e., the personal ministry one has been given by the Lord, Eph. 4:7–13), healing (1 Cor. 12:9, 28, 30), and even an individual’s particular sexual drive (1 Cor. 7:7). Verse 5 speaks of services, and verse 6 speaks of energies and energizings, and they point out that even though those can be different, it is the same God who energizes them. Now to each one the manifestation of the Spirit [spirit] is given for the common good. It is vital that we properly understand this verse if we are going to properly understand this section of Scripture. The verse starts out with “Now,” which some versions have as “But.” The point is that there is a change between verses 4–6 and verse 7. In verses 4–6 the subject was “distributions,” but now Paul is speaking of something that “each one” has, which is the “manifestation” of holy spirit. Each Christian has the “manifestation” of the spirit, which is singular because if a person has holy spirit, then he naturally has all of the ways it can be shown in the senses world. If a person has a light bulb, he naturally has the manifestation of it—light, heat, and a higher electric bill. If a person has a Swiss Army knife, he naturally has the manifestation of that particular knife; usually a blade, screwdrivers, scissors, etc. The individual evidences are “manifestations,” plural, but the singular noun “manifestation” is used in the Bible to inclusively refer to all the ways holy spirit is brought into evidence in the life of a believer, and it is clear from the context of these verses and the scope of Scripture that every believer can operate all of the manifestations. A good way to think about the fact that the holy spirit is singular but has nine manifestations is to think of a beautiful diamond set in a diamond ring. The diamond is a singular stone, but it has many facets. It is impossible to have the diamond without having all the facets, as they are part of the diamond itself. That is quite a good metaphor for holy spirit. It is impossible to have holy spirit without having the capacity to manifest it, because the manifestations are an inherent part of it. In fact, God placed holy spirit on believers in the Hebrew Scriptures so they would manifest it, walk in its power, and thus do the work He wanted them to do. Of course, a person can have holy spirit and not walk in the power it gives. He can quench the spirit by not speaking in tongues, not walking in faith, etc. This is in part what makes a “carnal” Christian (1 Cor. 3:3 KJV), one who lives by what his flesh dictates, and not by the Word of God or the spirit of God. It is important that 1 Corinthians 12:7 is set apart from verses 4–6 to help us understand that even though we have individual “gifts” from God, we can operate all of the manifestations. Thus, each one is challenged to push himself in the faith so that he can help other people. There is only so much we can do of our own ability. Sooner or later, to really help someone, we have to use spiritual power. We will need to pray in tongues (1 Cor. 14:14), interpret or prophesy for the edification of the Church (1 Cor. 14:4 and 5), hear from God to know what to do and how to do it (Acts 9:10–16), heal someone (Acts 3:1–8), or cast out a demon (Luke 10:17). These things require spiritual power, and the believer has such power (Acts 1:8), “Christ” in him (Col. 1:27). Remember, every Christian is filled with holy spirit. The operation of spiritual power has its origin in God, who works through believers who trust and obey Him. Thus, the operation of the power of holy spirit is directed by the Lord, either directly or by the written Word and love. For example, a believer can speak in tongues at will, but is directed by the Lord how to do it decently and in order (cp. 1 Cor. 14:23). When it comes to a message of knowledge or wisdom, or doing a healing, miracle, or casting out a demon, one cannot do these things without the Lord’s direct provision. He gives the revelation and he supplies the power for the healing or miracle. Believers must recognize this and give credit to the Lord. 1 Corinthians 12:7 and 8 remind us that the Lord is the one who deserves the credit. They repeat that Christians are “given” the manifestation of the spirit, and because it was “given” to them, they should not boast about it—and the Corinthians were boasting about the things they had been given, taking the credit for them as if they were spiritually powerful on their own. There is no place in the Christian life for boasting in oneself and taking the credit for what God and the Lord Jesus have done. Another way the Lord reminded the Corinthians that the manifestations were operated only with his provision was to repeat that it was only because of the gift of holy spirit that they had any manifestation at all. We all need to remember that, “to one is given through the spirit…and to another…because of the same spirit; to another…by the same spirit; and to another…by the one spirit.” The fourfold repetition of “spirit” places great emphasis on the source of the manifestation. In the Greek text there is an even further emphasis on the fact that the manifestations come from the one gift of holy spirit. In verse 8 we are told that a message of wisdom comes “through” the spirit. Then we are told that the message of knowledge comes “because of” the same spirit. Then we are told in verse 9 that faith comes “by” the same spirit, and healings “by” the “one” spirit. Seeing the words, “is given,” “through,” “because of,” and “by,” there should be no question that it is the Lord who is working, and working through holy spirit. If there is any division and quarreling among the people, it is only because they are so proud and carnal that they cannot see that it is the Lord himself who energizes people differently so that the needs of the entire Body of Christ can be met. The different “energizings” that the Lord distributes at any given time to the people of the Church reflect the needs of the Church. That is why in verses 8–10 the manifestations are said to be “to one…to another…to another….” The Corinthians never doubted that they each had the spiritual ability to utilize all of the manifestations of the spirit that are listed in verses 8–10. However, the Lord does not energize all the manifestations in every person at the same time. In fact, Paul directs the Corinthians to manifest the spirit in a way that is a blessing to the Church. He says, “…When you come together, everyone has a hymn, or a word of instruction, a revelation, a tongue or an interpretation. All of these must be done for the strengthening of the church” (1 Cor. 14:26b). He also reminds them that if they all speak in tongues when an unbeliever is in the room it could give him the wrong idea (1 Cor. 14:23). It is not the case, as some teach, that each individual can utilize only one manifestation (usually miscalled “gifts”). We have heard some people say, for example, “God has not given me the gift of tongues.” The book of 1 Corinthians and other writings to the Church (such as Acts) are very clear that every Christian has the spiritual ability to speak in tongues, even if he never has. What this section of Scripture is saying is that at any given gathering of believers the Lord will energize different manifestations in different people. He will give one person a message of knowledge, “another” will prophecy, “another” will speak in tongues and then interpret, “another” may minister healing to a sick person, and so forth. Every Christian has the power of holy spirit, but the way that power will be used at any given time depends on the purposes of God, and upon our faith and willingness to step out and use what we have been given. No matter who does what, it is always the same Lord who distributes the power and always the same gift of holy spirit that is energized. That each person can manifest all nine manifestations is clearly implied in the Greek text of verses 7 and 8. The words “to one” at the beginning of verse 8 are the masculine singular relative pronoun, “who.” Any pronoun can be replaced by its antecedent and the sentence will still make sense. For example, in the sentence, “Bill married Sally, who is a journalist,” the pronoun “who” can be replaced by its antecedent, Sally, and the sentence be perfectly clear: “Bill married Sally; Sally is a journalist.” If we replace the relative pronoun in verse 8 with its antecedent, “each,” in verse 7, then it would read, “Now to each one the manifestation of the spirit is given…to each one is given the message of wisdom….”7 However, even though each Christian can receive a message of wisdom from the Lord Jesus, he will speak to different people at different times. After speaking of the nine manifestations, Scripture returns to the theme of distributions, reminding believers that the Lord distributes to each as he purposes. Now all these the one and the same Spirit energizes, distributing to each one individually just as he purposes. Verse 11 is a summary of what we have just seen in verses 4–10. It is the Lord Jesus who energizes, as he purposes, “all” the manifestations and spiritual things talked about in this chapter, and the words “distributing” (also in vv. 4, 5, and 6) and “energizes” (also in v. 6) help tie the whole section together. This brings up a point that should loom large in the life of every believer: if it is the Lord who energizes in individuals according to his purposes, how do we get to the point that he energizes us more? The answer to that question is that if we want to be energized by him, we need to obey the Word of God and live a holy and faith-filled life. Occasionally there is some discussion about whether the “he” near the end of verse 11 refers to the Lord or to the believer. It has to refer to the Lord. He is the one doing the distributing, and he does so according to his own purposes, which is why “one” believer “is given” one manifestation and “another” believer “is given” another. If the “he” in the verse referred to the believer, then the Lord would not be able to coordinate the worship service and distribute things “…in a fitting and orderly way” (1 Cor. 14:40). The believers at the fellowship, even if kindhearted and selfless, would not know what their particular purpose should be at the meeting. In contrast, the Lord knows the hearts and abilities of all men, and his own purposes as well, and distributes spiritual things so that the people are most blessed. So far in 1 Corinthians 12 we have seen how it is the “same” Lord Jesus and the “same” God who distribute to, and energize, each believer. No Christian has anything that he has not been “given.” Starting in verse 12 and going to the end of the chapter, the Lord gives another example of what he distributes. He distributes members in the Body of Christ. Verse 12 starts with, “For even as” or, “For just as.”9 Thus the way the Lord works with spiritual things is “just as” the way he works with the Body, that is, he distributes as it pleases him. It is now clear why the spiritual things of 1 Corinthians 12:1–11 are in the same chapter as the members of the Body of Christ (verses 12–31). All of them are distributions of the Lord, given as he sees fit. Do Christians differ? Yes, but that is no reason to boast or to elevate one person above another, because all that we are and have are the Lord’s work. It is due to his great love for the Body and his desire that each person be taken care of that he distributes different things to different people. If we all walk powerfully in what he gives us, the Body of Christ will function as well as a perfectly tuned engine. The chapter closes with the way things actually work in any given body of believers. 28 And in the church God has appointed first of all apostles, second prophets, third teachers, then workers of miracles, also those having gifts of healing, those able to help others, those with gifts of administration, and those speaking in different kinds of tongues. 29 Are all apostles? Are all prophets? Are all teachers? Do all work miracles? 30 Do all have gifts of healing? Do all speak in tongues? Do all interpret? 31 But eagerly desire the greater gifts. And now I will show you the most excellent way. This section of Scripture blends the manifestations and the ministries, pointing out that not everyone will be energized in the same way at the same time. This is exactly what we have seen earlier in this chapter. It confuses some readers that the manifestations (e.g., tongues, interpretation, miracles, etc.) are blended with ministries (e.g., apostles, prophets, teachers, etc. ), and some thus conclude that not everyone can speak in tongues or interpret. However, we must remember that these verses are a summary statement, we dare not lose sight of the point of 1 Corinthians 12 when reading them. The Lord distributes to every person, and at any given time he will energize spiritual gifts and manifestations differently in different people, even though each person can manifest all nine manifestations. Verses 28–30 are a fitting conclusion to the chapter, reflecting the reality that at any given time, in any given meeting, not every person will do everything. It is the Lord who distributes and energizes as it pleases him. Another lesson 1 Corinthians 12:7–10 teaches is how God groups the manifestations of holy spirit. In order to understand it clearly, let us quote those verses again. 7 Now to each one is given the manifestation of the spirit for the common good. 8 For to one is given through the spirit a message of wisdom; and to another (allos) a message of knowledge because of the same spirit; 9 to a different one (heteros) faith by the same spirit; and to another (allos) gifts of healings by the one spirit; 10 and to another (allos) working of miracles; to another (allos) prophecy; to another (allos) discerning of spirits; to a different one (heteros) various kinds of tongues; and to another (allos) the interpretation of tongues. A message of wisdom and a message of knowledge, which are of the same sort (allos). Faith, healings, miracles, prophecy, and discerning of spirits, which are of the same sort (allos) but different (heteros) from Group 1. Many scholars have seen and acknowledged the grouping of the manifestations (which most of them refer to as gifts). The reason for the three groups of manifestations, as they are given, becomes clear from the study of the Word of God and from living them out. There are many things in the Bible that are fully understood only when acted upon and lived out. God did not design His Word to be understood by academicians, but by disciples. Jesus made this clear. 1. We use our own translation here primarily because of the lower case and upper case “s” on spirit and because of the names of the manifestations themselves. 2. It is “because of the same spirit,” i.e., because of the gift of holy spirit, that a person can receive revelation. The word kata (because of) has a variety of meanings. Bauer’s Greek Lexicon lists two major concepts, with more specific meanings under those, and even more specific meanings under those. For this verse, he notes “the mng. [meaning] ‘in accordance w. [with]’ can also disappear entirely, so that k. [kata] means simply because of, as a result of, on the basis of….” (Arndt and Gingrich, op. cit., A Greek-English Lexicon) p. 407. 3. When it comes to spiritual things, God is the primary or “first” cause, and Jesus is the “immediate” cause. For example, God gave the gift of holy spirit to Jesus, who gave it to us (Acts 2:33). God gave the information contained in the book of Revelation to Jesus, who then made sure it was given to mankind (Rev. 1:1). God puts people in the Church as it pleases Him (1 Cor. 12:18), but Jesus is said to actually give the ministries (Eph. 4:7–11). These examples could be multiplied many times, and the Christian should not be confused just because sometimes God is said to do something while other times Jesus is said to do it. Both are sources of the blessings, and at different times both are said to do the same things. Unlike the divided Church at Corinth, God and Jesus always work in harmony. 4. We use Lenski here because of the literal nature of his work and his accurate rendition of “distributions,” which is important to see in order to properly understand verse 11, which uses the verb form of the word diairesis. “The term diairesis appears only here in the New Testament [Christian Scriptures] and means, not “diversities” as our versions translate (for the fact that the gifts are diverse is too obvious to require statement), but ‘distributions.’ The gifts are parceled out….” (R. C. H. Lenski, The Interpretation of I and II Corinthians (Augsburg Publishing House, Minneapolis, MN, 1963), p. 495 (We changed the Greek letters in Lenski’s book into English letters). Furthermore, he uses “energizes” in verse 6, which is also used in verse 11, tying the two verses together. Vincent also points out the connection between the distributions in verse 6 and verse 11, and notes that although diairesis can be translated “diversities” or “distributions,” the connection with v. 11 favors “distributions” (Marvin Vincent, Vincent’s Word Studies in the New Testament (Hendrickson Publishers, Peabody, MA), Vol. 3, p. 255). 5. In this verse, “spirit” refers to the gift of holy spirit that each believer has received. This section echoes Ephesians 4:3–6, which also encourages believers to be unified and mentions seven important things around which to build their unity, among them one spirit, one Lord, and one God. This is not a reference to the Trinity, which is the three being “one,” it is making the point that all three are involved with spiritual manifestations. 6. The word “ministrations” is a plural noun and means ministries or services. 7. In the Greek text of verse 7, hekastos is the natural antecedent of the ho that begins verse 8. Hekastos is the subject in the sentence and matches ho in case, number, and gender. 8. We use our own translation here for several reasons, but primarily to show the connection between the “distributions” of verses 4, 5, and 6 and the distribution in this verse and to show clearly that “energizes” is a verb (many versions translate it as a noun). 9. Verse 12 opens in the Greek with kathaper gar, which means “For just as,” or, “For even as,” or, “For as,” and almost every version recognizes that fact (the NIV does not). 10. These verses contain some manifestations and some ministries. The manifestations of holy spirit are miracles, healing, tongues, and interpretation. The equipping ministries are apostles, prophets, teachers, those able to help others (Rom. 12:7), and there are those with gifts of administration (Rom. 12:8). 11. Vine, op. cit., Vine’s Complete Expository Dictionary, “another,” p. 29. 12. It is not the people who are allos and heteros, but the people as they are functioning, utilizing the manifestations. 13. Lenski, op. cit., The Interpretation of I and II Corinthians, p. 499 (We changed the Greek letters in Lenski’s book into English letters). 14. Troy Welch, Bible Doctrine 102: A Syllabus (Channel Island Bible College and Seminary, Oxnard, CA), p. 37. 15. Raymond Collins, Sacra Pagina: First Corinthians (The Liturgical Press, Collegeville, MN, 1999), p. 451. 16. Alfred Plummer and Archibald Robertson, The International Critical Commentary: 1 Corinthians, (T&T Clark, Edinburg), p. 265. We changed the Greek letters to English letters. We assert that God does not vary His vocabulary simply to avoid monotony. He has a divine purpose for what He writes. 17. G. G. Findlay, The Expositor’s Greek Testament, (Wm. B. Eerdman’s Publishing Company, Grand Rapids, MI, reprinted 1990), Vol. 2, p. 888. Findlay also makes the following observation: the first two are through the mind, the second in distinction from the mind, and the third in suppression of the mind. 18. God does not name the three groups of manifestations, so different scholars have seen different emphasis in the groups, and “named” them accordingly. We would call the groups, “Revelation; Power; and Worship,” or something similar. Plummer sees the groups connected with “Intellect; Faith, and Tongues” (Plummer and Robertson, op. cit., The International Critical Commentary, p. 265), while Lenski says, “intellect; faith; the tongue” (Lenski, op. cit., The Interpretation of I and II Corinthians, p. 499). Welch groups them as based on the Word, “miracle gifts” and “sign gifts” (Welch, op. cit., Bible Doctrine 102, p. 37).